Power or connect your Garmin Fishfinder 300C/400C or Garmin GPSMAP 451s, GPSMAP 551s or other GPSMAP 400 or GPSMAP 500 series chartplotter that features a sounder to a network with this power/data/xdcr cable. This cable also includes sounder/transducer connectivity. Please note: This cable is only required if you own a GPSMAP 400 or GPSMAP 500 series chartplotter with a sounder e.g. GPSMAP 551s. If you own the GPSMAP 400 or GPSMAP 500 series model without a sounder you can purchase an alternate cable instead. Compatibility: Compatible with Garmin Fishfinder, 300C, 400C, GPSMAP 420s, 421s, 430s, 431s, 440s, 441s, 450s, 451s, 520s, 521s, 525s, 530s, 531s, 535s, 536s, 540s, 541s, 545s, 546s, 551s, 556s. Connect and/or power your compatible Garmin Fishfinder 300C/400C or Garmin GPSMAP 451s, GPSMAP 551s or other GPSMAP 400 or GPSMAP 500 series chartplotter that features a sounder to a network with this power/data/xdcr cable. This cable also includes sounder/transducer connectivity. 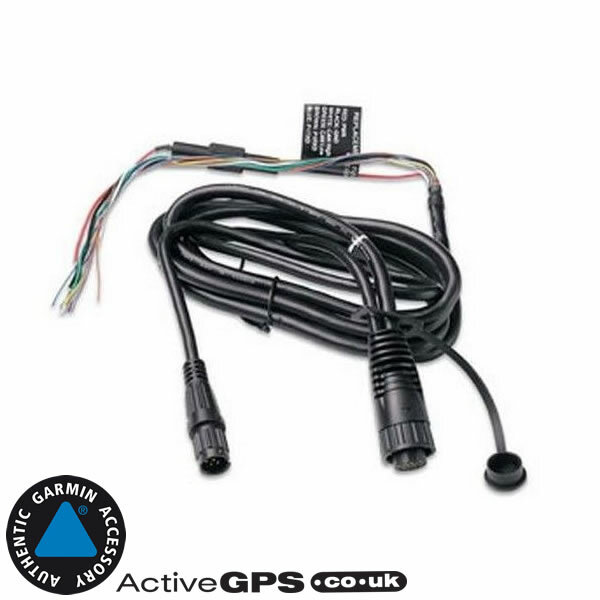 Please note: This cable is only required if you own a GPSMAP 400 or GPSMAP 500 series chartplotter with a sounder e.g. GPSMAP 451s. If you own the GPSMAP 400 or GPSMAP 500 series model without a sounder you can purchase an alternate cable instead. If you'd like to add Garmin marine BlueCharts to your Garmin GPSMAP 400 or GPSMAP 500 series ONLY (not compatible with Fishfinder 300C and Fishfinder 400C) device you can do just that by buying and loading the latest Garmin BlueChart G3 and G3 Vision. The charts come preloaded on microSD card together with a SD card adaptor. Simply insert the SD card into your Garmin GPSMAP 451s, GPSMAP 551s or GPSMAP 556s and you are ready to take to sea with the latest nautical Garmin charts. What is the Fishfinder and GPSMAP sounder power/data/xdcr cable compatible with? Garmin Fishfinder 300C, 400C, GPSMAP 420, 420s, 421s, 430, 430s, 431s, 440, 440s, 441s, 450s, 451s, 520, 520s, 521s, 525, 525s, 530, 530s, 531s, 535, 535s, 536s, 540, 540s, 541s, 545, 545s, 546s, 551s, 556s. Please note: This cable is only required if you own a GPSMAP 400 or GPSMAP 500 series chartplotter with a sounder e.g. GPSMAP 451s. If you own the GPSMAP 400 or 500 series model without a sounder you can purchase an alternate cable instead. Question: Can you tell me the difference between Data cable Garmin part number: 010-10917-00 and 010-10918-00? Answer: While part numbers 010-10917-00 and 010-10918-00 are designed the fit the same Garmin model ranges e.g. Garmin GPSMAP 451. The 010-10917-00 part number DOES NOT include a sounder connection, a sounder connection is required if you wish to connect a transducer to the GPSMAP 450, this making it a GPSMAP 450s. The 010-10918-00 part number includes a sounder connection. Do you have a question about the Garmin Fishfinder/GPSMAP Sounder power/data/xdcr Cable? Submit your question via our contact page.